The Shoe Factory Art Co-op is a contemporary cooperative art gallery located in the Anderson Arts Building in the Neighborhood of the Arts. The building is the former factory of local shoe manufacturer E.P. Reed & Co., who moved into their newly built brick building in 1906 from a former location on Saint Paul Street. 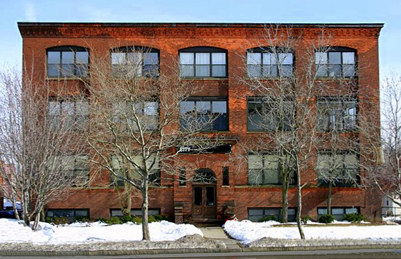 The Shoe Factory Art Co-op inhabits a studio on the second floor along with over 50 art studio tenant neighbors throughout the historic four story building. Their gallery exhibits a variety of art mediums created by regional artists. Artwork is available for purchase. The studio also offers drawing and painting classes weekly, year-round for adults, teens, and preteens.